Bastion is one of most stylish action-RPGs to come along in a while. Indie studio Supergiant Games brought a new demo of Bastion to E3 to show off a little more of its level variety. 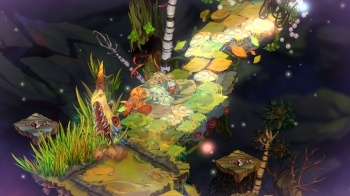 Bastion is an action-RPG with hand-painted visuals and a unique twist of being narrated in its entirety by a deep-voiced entity. For example, whenever you do something in the game, the narrator will explain what just happened. It's not as annoying as it may sound, because the narrator doesn't do play-by-play. Rather, he explains the actions of the character in terms of the game's storyline, which in other games may be explained through NPC dialogue, quest text, etc. The E3 Bastion demo took place in something of a semiarid desert, with sandy portions but also strange plants all about. I started with a gun that fired a wide blast as one primary weapon and a spear as the other. Plants began to fire spikes at me from afar, so I had to dodge and fire my gun with proper timing. Another even more vicious plant peppered me with a steady stream that I had to wait and block before getting a shot in. Other enemies in this environment included some nasty birds, and all the while I was stalking a big bad (and it was stalking me) that was something like a landshark. The landshark moved through the level as a horn exposed through the sand, only emerging when it had something to bite (like me). As I would move through the environment the shark would pop up and the narrator would explain what it was and how to avoid it, but indirectly. Stepping in high tufts of grass would leave me open to attack from the landshark that could only emerge there. The narrator would say something along the lines of: "Walking through the sandy grass isn't the best of ideas." This hinted that it'd be best to roll through the grass as quickly as possible when necessary. It's a simple example of how Bastion's narration and gameplay merge. At the end of the level, after killing plenty of spike-shooting plants and birds, you take it to the landshark once and for all. It pops up when you get near its horn, so I had to get close, immediately dodge, and turn around to attack. After a short time, the narrator clued me in the that landshark was getting agitated. Attack plants appeared so I used my decoy special ability to distract the shark while I took down the plants. Then, killing the landshark was only a matter of time. The E3 demo was pretty short, but more of a challenge than what I'd previously seen from Bastion. It featured all new enemies and gameplay situations, giving me hope that the rest of the game will continue to innovate rather than giving us the same enemies over and over like some titles. Plus, that narrator is just so damn cool. Bastion will be released first on XBLA during one of the five weeks of Microsoft's Summer of Arcade which kicks off on July 20.